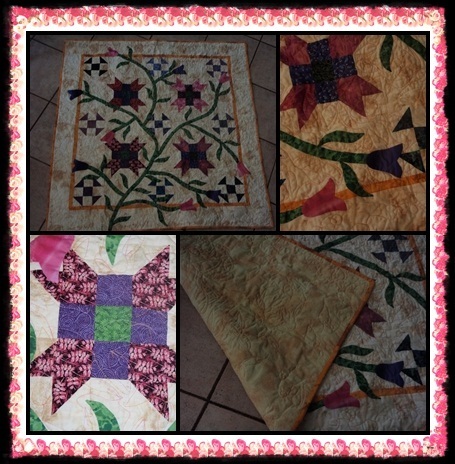 I have joined TWO challenges this year, the FMQ challenge at SewCalGal and the Sew Its Finished UFO challenge. This tablecloth is a complete for both challenges as I have used the free flowing leaves from FMQ's January challenge on the Iowa girl tablecloth I started over 5 years ago. The top was finished the year I started it but it sat waiting to be quilted. I finally had the courage to quilt it after watching January's tutorial. I wanted something more than the stippling that I could just manage. The quilting is not fantastic but its a start, I really am looking forward to improving my FMQ by trying each of the tutorials given over the course of this year. I finished the binding last night . So that's finish 5 & 6 for me. Yayyyyyyyyyyyy. Gail, you're setting a great example with all your UFOs that have been converted to FOs! Gail it is never too late to finish something and it usually feels soooo good. WEll done.